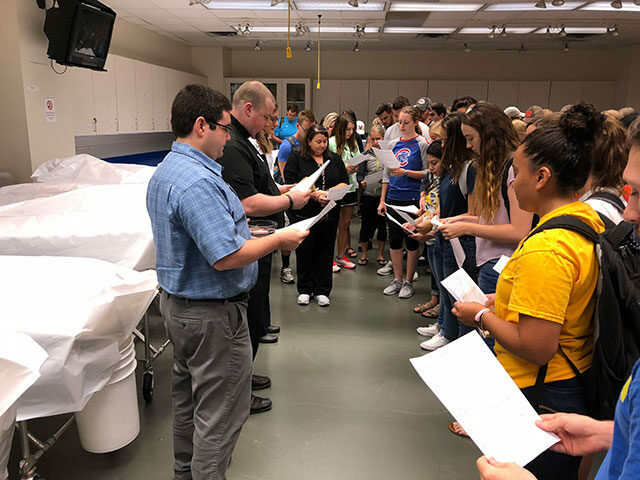 Clarke University held a Blessing of the Cadavers service Wednesday morning to honor those who donated their bodies to science through the University of Iowa’s Deeded Body Program. Every year, Clarke University obtains the cadavers from University of Iowa. Clarke hosts a Blessing of the Cadavers service at the start of the fall semester. More than 200 members of the Clarke University community attended the service, overflowing the cadaver lab to pay respects to the nine donors. Clarke Chaplain Father Andrew Marr and Director of Campus Ministry Hunter Darrouzet led the ceremony. Fr. Marr shared with those in attendance that the bodies are treated with the utmost respect and that Clarke University is very grateful to the families of the donors as well. “I want the families just to know the deep gratitude that everyone here has and to recognize that their gift of this person’s body is helping so many people throughout time,” Marr said. Michelle Slover, Professor of Biology, organizes this event every year. Dr. Slover teaches Human Gross Anatomy as well as Human Anatomy and Physiology (A&P) I and II. She added it also helps ease the anxieties of some students who may be nervous about working in the lab with cadavers. Besides the courses that Slover teaches, the anatomical donors are used in neuroscience, taught by Laura Hecker, Assistant Professor of Biology. Dr. Hecker also teaches some of the labs for A&P with Slover. Undergraduate students studying biology, nursing, athletic training, and psychology as well as graduate students in the doctor of physical therapy program are learning from Clarke’s cadavers. At the end of each academic year, the cadavers are returned to the University of Iowa for cremation. The ashes are either given to family members or buried. Students know very little about the cadavers other than their anatomical gender, age at time of death died, and cause of death. While no names or other identifying information are provided, the students often learn a bit about the donors based upon surgical evidence discovered during dissection. Clarke’s cadaver lab is a state-of-the art facility which provides students with the chance to see the musculature of real cadavers. This creates an active learning environment that allows students to have a hands-on experience that brings learning full circle. Students also learn about a variety of pathologies and get to see first-hand the effects of disease on organ systems. Having the lab at an undergraduate level is a rare benefit that not many colleges can provide. Clarke University will celebrate 175 years of service throughout the 2018-19 academic year. Founded in 1843 by the Sisters of Charity of the Blessed Virgin Mary, Clarke is located near the Mississippi River in the thriving city of Dubuque, Iowa. It is the only BVM university in the country. Clarke is a Catholic, liberal arts and sciences university dedicated to preparing students who positively impact their workplace, family, and community. Academic offerings include more than 40 undergraduate liberal arts and pre-professional programs, and six graduate degree programs.